The 15 years of experience of our company allow us to help you target your needs and to establish with you, your landscaping dreams. Whether to redevelop an existing arrangement or to create a new one, we will assure you a realization that will resist the time and ages in beauty. Our team of experts will manage the design and estimation of the project; we will offer choices of materials and follow the progression of the work. We work with a plan that you have already in hand or we will propose you one. Feel free to request an estimate free of charge. Each year new product styles, sizes, colors and textures to give you greater flexibility and more options. We are always looking to be even more creative, even more pioneering in our products. 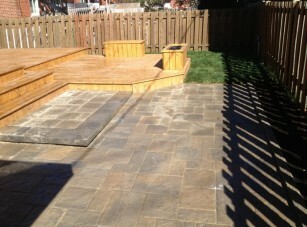 Permacon is Canada’s first choice in landscaping and masonry products. 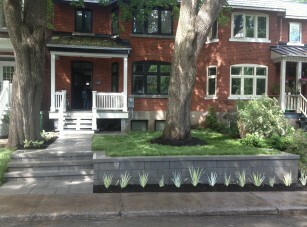 Pavers, walls, steps, slabs, curbs, stones and bricks will help you create a world of colours and shapes. A product made by TRANSPAVÉ is more resistant to heavy traffic and erosion than any competing product. Throughout its life, a TRANSPAVÉ product will keep a uniform appearance irrespective of age.